Tsage Douglas standing in front of the Federal Reserve Bank of Philadelphia. LEXINGTON, Ky. (Aug. 17, 2018) — The connection between public health and economics might not be obvious to some, but the two fields have a unique and surprising interplay. Economics and public health both impact the well-being of the community. That is one of the reasons Tsage Douglas chose to earn a degree in public health from the University of Kentucky College of Public Health and a degree in foreign language and international economics in the UK College of Arts and Sciences. Since taking Advanced Placement Micro and Macro Economics at Scott County High School, Douglas has been interested in the Federal Reserve. It was at this time that her interests in macroeconomic and developmental economic research were sparked. 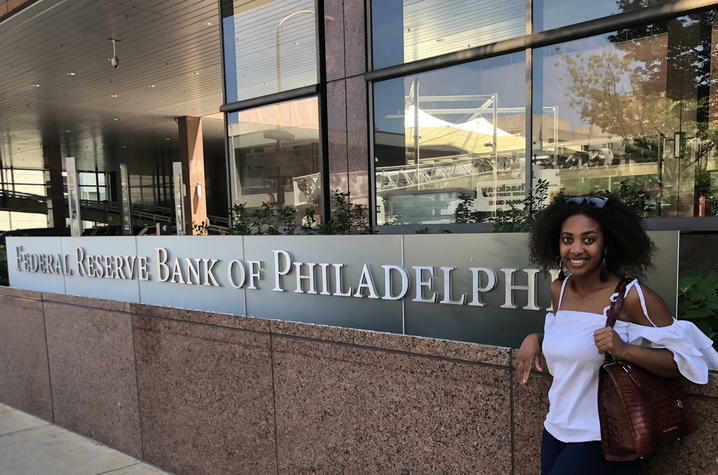 This summer, the rising UK junior had the opportunity to fulfill a dream when she worked as a statistical analyst intern at the Federal Reserve Bank of Philadelphia. Though Douglas had never traveled to Philadelphia before moving there for the summer, she knew she'd enjoy the city and the experience. During the internship, Douglas conducted a statistical analysis for two projects and provided insight to leaders. Those projects allowed Douglas to put her French language skills to use, as well as refine her coding capacity. The ability to create opportunities for herself is one of the reasons her post-graduation goals include returning to the Federal Reserve to work as a research assistant. When Douglas began her internship, she was well prepared to assist with research and conduct statistical analysis. While in high school, she developed skills in biomedical research. When she began her career at UK, she made the adventurous switch to economic, Ph.D.-minded research. Douglas also said her involvement in the Chellgren Student Fellows Program prepared her for the program. "The Chellgren fellowship is all about research," she said. With the support of faculty and staff at UK, Douglas is prepared to conduct research in a medical lab or analyze economic data. When she returns to campus in August, Douglas will be as busy as she was during her summer "break." She currently serves as the president of the Black Student Union, president of the Economics Society and director of Beyond the Blue. For many, summer is a time to slow down, get a break from school and maybe take a vacation. At the University of Kentucky, summer is when our faculty, staff, clinicians and students prepare for a new school year, conduct research, treat patients and get experience through internships and service work. Class may not be in session, but at UK we never slow down.